"Roman language" redirects here. It is not to be confused with Romani language, Romanian language, or Romanesco language. In antiquity, Roman schools of grammar and rhetoric. Today, the Pontifical Academy for Latin. The extensive use of elements from vernacular speech by the earliest authors and inscriptions of the Roman Republic make it clear that the original, unwritten language of the Roman Kingdom was an only partially deducible colloquial form, the predecessor to Vulgar Latin. By the arrival of the late Roman Republic, a standard, literate form had arisen from the speech of the educated, now referred to as Classical Latin. Vulgar Latin, by contrast, is the name given to the more rapidly changing colloquial language, which was spoken throughout the empire. Because of the Roman conquests, Latin spread to many Mediterranean and some northern European regions, and the dialects spoken in these areas, mixed to various degrees with the indigenous languages, developed into the modern Romance tongues. Classical Latin slowly changed with the Decline of the Roman Empire, as education and wealth became ever scarcer. The consequent Medieval Latin, influenced by various Germanic and proto-Romance languages until expurgated by Renaissance scholars, was used as the language of international communication, scholarship, and science until well into the 18th century, when it began to be supplanted by vernaculars. Latin is a highly inflected language, with three distinct genders, seven noun cases, four verb conjugations, six tenses, three persons, three moods, two voices, two aspects, and two numbers. A dual number ("a pair of") is present in Old Latin. One of the rarer of the seven cases is the locative, only marked in proper place names and a few common nouns. Otherwise, the locative function ("place where") has merged with the ablative. The vocative, a case of direct address, is marked by an ending only in words of the second declension. Otherwise, the vocative has merged with the nominative, except that the particle O typically precedes any vocative, marked or not. There are only five fully productive cases, that is, in the few instances of the formation of a distinct locative or vocative, the endings are specific to those words and cannot be placed on other stems of the declension to produce a locative or vocative. In contrast, the plural nominative ending of the first declension may be used to form any first declension plural. As a result of this case ambiguity, different authors list different numbers of cases: 5, 6, or 7. Adjectives and adverbs are compared, and the former are inflected according to case, gender, and number. In view of the fact that adjectives are often used for nouns, the two are termed substantives. Although Classical Latin has demonstrative pronouns indicating different degrees of proximity ("this one here", "that one there"), it does not have articles. Later Romance language articles developed from the demonstrative pronouns, e.g. le and la (French) from ille and illa, and su and sa (Sardinian) from ipse and ipsa. Latin culture has been passed down through a number of broad genres. Most inscriptions have been published in an internationally agreed-upon, monumental, multi-volume series termed the Corpus Inscriptionum Latinarum (CIL). Authors and publishers vary, but the format is approximately the same: volumes detailing inscriptions with a critical apparatus stating the provenance and relevant information. The reading and interpretation of these inscriptions is the subject matter of the field of epigraphy. There are approximately 270,000 known inscriptions. Latin translations of modern literature such as The Hobbit,Treasure Island, Robinson Crusoe, Paddington Bear, Winnie the Pooh, The Adventures of Tintin, Asterix, Harry Potter, Walter the Farting Dog, Le Petit Prince, Max und Moritz, How the Grinch Stole Christmas, The Cat in the Hat, and a book of fairy tales, "fabulae mirabiles," are intended to garner popular interest in the language. Additional resources include phrasebooks and resources for rendering everyday phrases and concepts into Latin, such as Meissner's Latin Phrasebook. Latin has had a significant influence in the formation of English at all stages of its insular development. In the medieval period, much borrowing from Latin occurred through ecclesiastical usage established by Saint Augustine of Canterbury in the 6th century, or indirectly after the Norman Conquest through the Anglo-Norman language. From the 16th to the 18th centuries, English writers cobbled together huge numbers of new words from Latin and Greek words. These were dubbed inkhorn terms, as if they had spilled from a pot of ink. Many of these words were used once by the author and then forgotten. Some useful ones, though, survived, such as imbibe and extrapolate. Many of the most common polysyllabic English words are of Latin origin, through the medium of Old French. - officially recognized and widely used between 9th and 18th centuries commonly used in foreign relations and popular as a second language among some of the nobility. The generally recognized main phases under their most frequent names are introduced below. The earliest known is Old Latin, which was spoken from the Roman Kingdom to the middle Republican period, and is attested both in inscriptions and in some of the earliest extant literary works, such as the comedies of Plautus and Terence. During this period, the Latin alphabet was devised from the Etruscan alphabet. The writing style later changed from an initial right-to-left or boustrophedon to a left-to-right script. One way to determine whether a Romance language feature was in Vulgar Latin is to compare it with its parallel in Classical Latin. If it was not preferred in classical Latin, then it most likely came from the invisible contemporaneous vulgar Latin. For example, Romance "horse" (cavallo/cheval/caballo/cavalo) came from Latin caballus. However, classical Latin used equus. Caballus therefore was most likely the spoken form. The term Medieval Latin refers to the written Latin in use during that portion of the post-classical period when no corresponding Latin vernacular existed. The spoken language had developed into the various incipient Romance languages; however, in the educated and official world Latin continued without its natural spoken base. Moreover, this Latin spread into lands that had never spoken Latin, such as the Germanic and Slavic nations. 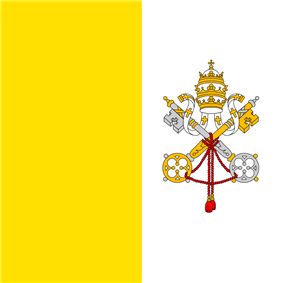 It became useful for international communication between the member states of the Holy Roman Empire and its allies. During the Early Modern Age Latin still was the most important language of culture in Europe. Therefore, until the end of the 18th century the majority of books were written in Latin. Many organizations today have Latin mottos, such as "Semper paratus" (always ready), the motto of the United States Coast Guard, and "Semper fidelis" (always faithful), the motto of the United States Marine Corps. Several of the states of the United States also have Latin mottos, such as "Montani semper liberi" (Mountaineers are always free), the state motto of West Virginia; "Sic semper tyrannis" (Thus always for tyrants), that of Virginia; "Qui transtulit sustinet" ("He who transplanted still sustains"), that of Connecticut; "Esse quam videri" (To be rather than to seem), that of North Carolina; "Si quaeris peninsulam amoenam, circumspice" ("If you seek a pleasant peninsula, look about you") that of Michigan. Another Latin motto is "Per ardua ad astra" (Through adversity/struggle to the stars), the motto of the RAF. Some schools adopt Latin mottos such as "Disce aut discede" of the Royal College, Colombo. There are many websites and forums maintained in Latin by enthusiasts. The Latin World Heritage Encyclopedia has more than 90,000 articles written in Latin. Latin is still taught in many high schools in Europe and the Americas as complementary teaching. It is still compulsory in schools like the Boston Latin School, Boston Latin Academy, the Italian Liceo classico and Liceo scientifico, and the Dutch gymnasium. In the pontifical universities postgraduate courses of Canon law are taught in Latin and papers should be written in the same language. No inherited verbal knowledge of the ancient pronunciation of Latin exists. It must be reconstructed. Among the data used for reconstruction listed by Allen are explicit statements by ancient authors, especially grammarians, about the pronunciation of a word, puns, ancient etymologies, Latin words stated in other languages, and so on. The period graphemes representing these phonemes are only a partial match to today's English alphabet, which, except for the capital letters, dates to the Middle Ages. Latin texts are nevertheless printed in it. The inscription from the Colosseum shown at the top of the article is a good example of the appearance of native Roman graphemes. Some notes concerning the mapping of Latin phonemes to English graphemes are given below. ⟨c⟩ /k/ Never as in nice; without aspiration, as in Italian peccare or English "sky"
⟨l⟩ /l/ Existed in two allophones: l exilis before /l/ and /i/, and l pinguis in all other positions, however the precise phonetic realisation of these allophones is uncertain. ⟨t⟩ /t/ Never as in English nation. ⟨qu⟩ /kʷ/ A labiovelar, considered one consonant. ⟨i⟩ /j/ Also ⟨j⟩. These are graphic variants. Like the previous, ⟨i⟩ stood for both consonant /j/ and vowel /i/: iucundus /juːkʊndʊs/ "pleasant", periucundus /pɛrjuːkʊndʊs/ "very pleasant". ⟨x⟩ /ks/ A double consonant, considered two consonants. Long consonants are represented by doubled spelling: puella = /pʊˈɛlːa/ ("girl"; similar to Italian nella), littera = /ˈlɪtːɛra/ ("letter", "character"; as in Italian petto), accidere = /akːɪdɛrɛ/ ("to happen"; stress on the second syllable; as in Italian ecco), addere = /ˈadːɛrɛ/ ("to add"), pessime = /ˈpɛsːimeː/ ("very/most badly") and the like. It is also notable that consonants at the end of syllables close these syllables clearly; that means the latter are pronounced longer: e.g. amare = /aˈmaːrɛ/ ("to love") has the quantitative structure short-long-short, whereas armare = /arˈmaːrɛ/ ("to arm") shows long-long-short. This feature of classical Latin is crucial to the understanding and retracing of Latin poetical rhythms of classical and ensuing times, which are mainly based on syllable lengths, less on the word stresses. ⟨u⟩ = /ʊ/ (as in put) when short and /uː/ (as in true) when long ⟨ú⟩. Also ⟨v⟩. Classical Latin distinguished between long and short vowels, and the use of the apex, which indicates long vowels, was quite widespread during classical and postclassical times (á, é, I, ó, ú). In modern texts, long vowels are often indicated by a macron ⟨ā, ē, ī, ō, ū⟩, and short vowels are sometimes indicated by a breve ⟨ă, ĕ, ĭ, ŏ, ŭ⟩. The vowel-length distinction began to fade by Late Latin. A vowel followed by an ⟨m⟩ or ⟨n⟩ (maintained later by some Romance languages), either at the end of a word (⟨m⟩ only) or before another consonant, is nasal, as in monstrum /mõːstrũː/, and in many cases the consonant is not pronounced, as in French and Portuguese. Latin was written in the Latin alphabet, derived from the Old Italic alphabet, which was in turn drawn from the Greek and ultimately the Phoenician alphabet. This alphabet has continued to be used over the centuries as the script for the Romance, Celtic, Germanic, Baltic, Finnic, and many Slavic languages (Polish, Slovak, Slovene, Croatian and Czech), as well as for many other languages, such as Indonesian, Turkish, Tagalog, Vietnamese (previously used Chinese characters), and the Niger–Congo languages. The number of letters in the Latin alphabet has varied. When it was first derived from the Etruscan alphabet, it contained only 21. Later, G was added to represent /ɡ/, which had previously been spelled C; while Z ceased to be included in the alphabet due to non-use, as the language had no voiced alveolar fricative at the time. The letters Y and Z were later added to represent the Greek letters upsilon and zeta respectively in Greek loanwords. W was created in the 11th century from VV. It represented /w/ in Germanic languages, not in Latin, which still uses V for the purpose. J was distinguished from the original I only during the late Middle Ages, as was the letter U from V. Although some Latin dictionaries use J it is for the most part not used for Latin text as it was not used in classical times, although many other languages use it. Latin is a synthetic, fusional language, in the terminology of linguistic typology. In more traditional terminology, it is an inflected language, although the typologists are apt to say "inflecting". Thus words include an objective semantic element, and also markers specifying the grammatical use of the word. This fusion of root meaning and markers produces very compact sentence elements. For example, amō, "I love," is produced from a semantic element, ama-, "love," to which -ō, a first person singular marker, is suffixed. English requires two words to express the same meaning. Locative -- used to indicate a location (corresponding to the English "in" or "at"). This is far less common than the other six cases of Latin nouns and usually applies to cities, small towns, and islands smaller than the island of Rhodes, along with a few common nouns, such as the word domus, house. In the first and second declension singular, its form coincides with the genitive (Roma becomes Romae, "in Rome"). In the plural, and in the other declensions, it coincides with the ablative (Athēnae becomes Athēnīs, "at Athens"). In the case of the fourth declension word domus, the locative form, domī ("at home") differs from the standard form of all the other cases. Latin lacks definite and indefinite articles; thus puer currit can mean either "the boy is running" or "a boy is running". Latin sometimes uses prepositions, and sometimes doesn't, depending on the type of ablative being used in a prepositional phrase. A regular verb in Latin belongs to one of four main conjugations. A conjugation is "a class of verbs with similar inflected forms." The conjugations are identified by the last letter of the verb's present stem. The present stem can be found by taking the -re (or -ri, in the case of a deponent verb) ending off of the present infinitive. The infinitive of the first conjugation ends in -ā-re or -ā-ri (active and passive respectively); e.g., amāre, "to love," hortārī, "to exhort"; of the second conjugation by -ē-re or -ē-rī; e.g., monēre, "to warn", verērī, "to fear;" of the third conjugation by -ere, -ī; e.g., dūcere, "to lead," ūtī, "to use"; of the fourth by -ī-re, -ī-rī; e.g., audīre, "to hear," experīrī, "to attempt". Irregular verbs may not follow these types, or may be marked in a different way. The "endings" presented above are not the suffixed infinitive markers. The first letter in each case is the last of the stem, because of which the conjugations are also called the a-conjugation, e-conjugation and i-conjugation. The fused infinitive ending is -re or -rī. Third-conjugation stems end in a consonant: the consonant conjugation. Further, there is a subset of the 3rd conjugation, the i-stems, which behave somewhat like the 4th conjugation, as they are both i-stems, one short and the other long. These stem categories descend from PIE, and can therefore be compared to similar conjugations in other IE languages. The first principal part is the first person singular, present tense, indicative mood, active voice form of the verb. If the verb is impersonal, the first principal part will be in the third person. If the verb is deponent, the first principal part will be in the passive voice. The second principal part is the present infinitive active. The second principal part will be in the passive voice if the verb is deponent. The fourth principal part is the supine form, or alternatively, the nominative singular, perfect passive participle form of the verb. The fourth principal part can show either one gender of the participle, or all three genders (-us for masculine, -a for feminine, and -um for neuter). The fourth principal part will be the future participle if the verb cannot be made passive. Most modern Latin dictionaries, if only showing one gender, tend to show the masculine; however, many older dictionaries will instead show the neuter, as this coincides with the supine. The fourth principal part is sometimes omitted for intransitive verbs, although strictly in Latin these can be made passive if used impersonally, and the supine exists for these verbs. The graphic below displays the common inflected endings for the indicative mood in the active voice in all six tenses. For a list of words relating to Latin, see the Latin language category of words in , the free dictionary. Commons has media related to Latin language. Searches Lewis & Short's A Latin Dictionary and Lewis's An Elementary Latin Dictionary. Online results. Identifies the grammatical functions of words entered. Online results. Identifies the grammatical functions of all the words in sentences entered, using Perseus. Displays complete conjugations of verbs entered in first-person present singular form. Identifies Latin words entered. Translates English words entered. Combines Whittakers Words, Lewis and Short, Bennett's grammar and inflection tables in a browser addon. (a course in ecclesiastical Latin).